The leading drivers of the global benzaldehyde derivatives market currently include the rising demand for products from the industries of food and beverages, chemicals, agrochemicals, solvents and pharmaceuticals. A rise in the demand for benzaldehyde derivatives in emerging economies from Asia Pacific and the Middle East and Africa is anticipated to further propel the global benzaldehyde derivatives market and is also considered to be a strong opportunity for the globally prominent players. A high demand for solvents from the producers of resins, oils, cellulose acetates, cellulose ethers, and nitrates also presents a key area of opportunities for manufacturers from the global benzaldehyde derivatives market. However, the overall growth rate of this market may receive strong resistance from factors such as growing health concerns of long term exposure to several benzaldehyde derivatives and the growing threat of easily available substitutes in different end-user industries, including propionic and sorbic acids. The global benzaldehyde derivatives market is also being restrained by an overall volatility in crude oil prices and strict regulatory framework surrounding the oil and gas sector. 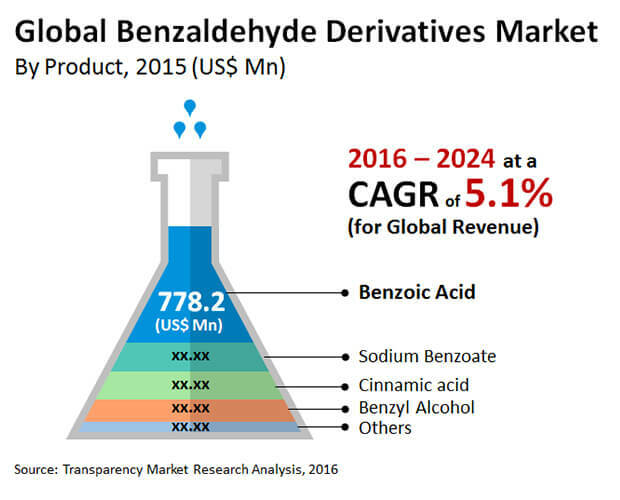 The global benzaldehyde derivative market was valued at US$1.37 bn in 2015 and is expected to reach US$2.14 bn by the end of 2024, after expanding at a CAGR of 5.1 % from 2016 to 2024. Benzoic acid accounted for the top share in the global benzaldehyde derivatives market in terms of volume as well as revenue generated in 2015, owing to its high rate of use in aromatic products, the food and beverages industry, and the pharmaceutical industry. By volume, benzoic acid was valued at US$778.2 mn within the global benzaldehyde derivatives market in 2015. The share held by benzoic acid in the global benzaldehyde derivatives market is expected to increase over the coming years due to a strong growth in demand from the food and chemicals industries. The growing demand for benzaldehyde derivatives in pharmaceutical and agrochemical industries are also expected to augment their global market over the coming years. Cinnamic acid also finds large volumes of demand as it is employed in flavors, synthetic indigo dyes and in the manufacture of specific drugs. It is also used in artificial sweeteners within the food industry. Benzoic acid is a commonly used as a food preservative and can inhibit the development of bacteria, molds, and yeasts. Sodium benzoate is another benzaldehyde derivative and finds use in the food industry as well as the pharmaceutical industry. It even has applications in the prevention of surface corrosion. Asia Pacific held the leading share in the global benzaldehyde derivatives market in terms of volume in 2015. Its nearly 60 % share in the global benzaldehyde derivatives market was attributed to a large consumption base, growth of various end user, and a relatively relaxed regulatory framework that led to a faster rate of development and use in the region’s food and chemical markets. Asia Pacific is expected to also be a highly attractive region till 2024, followed by Europe and North America. China accounted for the leading share in terms of volume within Asia Pacific, followed by Japan and other ASEAN countries. The growth rate of benzaldehyde derivatives in Europe and North America is very slow currently, owing to the maturation of the market and a low rate of product innovations. Till 2015, the leading players in the global benzaldehyde derivatives market included Emerald Performance Materials, Haihang Industry Co., Ltd, Merck KGaA, Guangzhou Shiny Co., Elan Chemical, Ltd, Kadillac Chemicals Pvt Ltd, Gujarat Alkalis and Chemicals Limited, Wuhan Dico Chemical Co., Ltd , Shimmer Chemicals Pvt. Ltd, Yingcheng Wuhan Organic Material Co., Ltd.
Benzaldehyde derivatives are the compounds which are derived from one of the simplest forms of aldehyde, benzaldehyde. These derivatives are found both in natural and synthetic forms. The commonly used benzaldehyde derivatives in chemical industry are cinnamic acid, benzoic acid, sodium benzoate and benzyl alcohol. Benzaldehyde derivatives can be formed from benzaldehyde via oxidation, reduction and disproportionation reactions. Key application areas of benzaldehyde derivatives include chemical industry, food industry, pharmaceutical industry, cosmetics industry and agriculture industry. Benzoic acid accounted for the major share of the global benzaldehyde derivatives market both in terms of revenue and volume owing to its growing use in aroma, food and pharmaceutical industries. In terms of volume, benzoic acid accounted for over 60 % of the global benzaldehyde derivatives market in 2015. The market share of benzoic acid is expected to increase in the forecast period due to robust growth in the food and chemical industries. The major market drivers of global benzaldehyde derivatives market are rising demand from food and chemical, agrochemical, solvent and pharmaceutical industry. However, the anticipated growth may be hindered by factors such as growing health concerns and threat of substitutes such as propionic and sorbic acids, volatility in crude oil prices and strict regulations. Rise in demand in developing regions such as Asia Pacific and Middle East & Africa is anticipated to propel the benzaldehyde derivatives market and is considered as an opportunity for the global benzaldehyde market. High demand for solvents in the production of oil, resin, cellulose ether, cellulose acetate, and nitrate presents significant opportunities in the benzaldehyde derivatives market. This study analyzes, estimates, and forecasts the global benzaldehyde derivatives market in terms of volume (tons) and revenue (US$ thousand) from 2015 to 2024. Market numbers given in the report describe the demand for global benzaldehyde derivatives, but not production or supply. The global benzaldehyde derivatives report also analyzes several driving and restraining factors and their impact on the market during the forecast period. The report provides comprehensive analysis of the global benzaldehyde derivatives by key products and regions. It segments the market into key products that include cinnamic acid, benzoic acid, sodium benzoate and benzyl alcohol. The report also segments the benzaldehyde derivatives market based on major geographies into North America, Europe, Asia Pacific, Latin America, and Middle East & Africa. Besides, the report comprises 12 unique country-specific analysis. Based on the product and country, the report analyzes the attractiveness of each segment and country with the help of an attractiveness tool. The study consist of value chain analysis, which offers a better understanding of key companies in the supply chain from raw material manufacturers to end-users. Additionally, the study examines market competition through Porter’s Five Forces Analysis. The report includes an overview of the market share of key companies in the global benzaldehyde derivatives market. Market share of companies has been derived on the basis of production by manufacturers of benzaldehyde derivatives. Key market players profiled in the study include Emerald Performance Materials, Merck KGaA, Haihang Industry Co., Ltd, Elan Chemical, Guangzhou Shiny Co., Ltd, Gujarat Alkalis and Chemicals Limited, Kadillac Chemicals Pvt Ltd, Shimmer Chemicals Pvt. Ltd, Wuhan Dico Chemical Co., Ltd , Yingcheng Wuhan Organic Material Co., Ltd. Out of these companies, Merck KGaA , Haihang Industry Co., Ltd and Emerald Performance Materials are the major benzaldehyde manufacturing companies. Secondary research sources that are typically referred to include broker reports, corporation websites, external patented databases, financial reports, stockholder presentations, Securities & Exchange Commission filings, proprietary databases and relevant patent and regulatory databases, national government documents, statistical databases, and market reports, news articles, press releases, and webcasts specific to companies operating in the market. Secondary sources referred for this study include ICIS Chemical Business Magazine, Hoover’s, Factiva, and company presentations.